The past few days have been insane around here! The first week of school always brings on a frenzy of paperwork, working out new routines, and getting back into the swing of things so to speak. But, it's been more than that. Seems we are always having to run errands, go to buy groceries, pick up last minute supplies, run, rush, do, and go! I tell ya, I am one tired mama! So, the reason I've been not posting regularly this week is, well, I haven't been home much! If this lifestyle of run, do, go is tiring for us moms, can you imagine how it is for kids? Think about that for a minute. How many activities are on their plates? 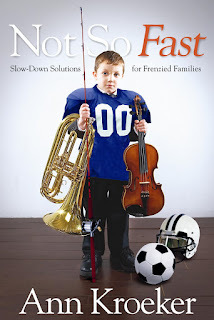 The book Not So Fast: Slow-Down Solutions for Frenzied Families really helped me understand what is important and what is not. I highly recommend it for families who, like mine, tend to get a bit frenzied. Dallas/Ft. Worth, TX—Today’s frenzied families find themselves fragmented in this high-speed, fast-paced, goal-oriented society. Even while racing to second jobs, appointments, lessons, practices, games, and clubs, we crave an antidote. How do we counteract the effects of our overcommitted culture? Replenish our depleted selves? Restore our rushed relationships?